Celebrity Dogs OK!, is a three minute digital film short by artists Wyllie O Hagan. The film refers to society’s obsession with fame and features a dog celebrity, imprisoned in “a gilded cage, caught in the headlights of fame”. The short film is a development of an altered book made by the artists in 2002, "The OK book of Dogs". 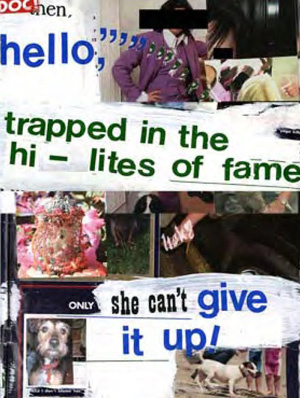 Here a celebrity publication was altered to include photographs of celebrity dogs and their owners which were gathered from celebrity magazines. Headline style comments by the artists were added in Letraset and alphabet stamps to the magazine pages. The dog shrine featured in the film was constructed from found materials in 2002. Housed within a cage is a model of dog "Gromit", a character from the Aardman Animations studio. The dog shrine marked the beginning of the artists work on celebrity and fame. You are barking mad! Looks like you really like Grommit!